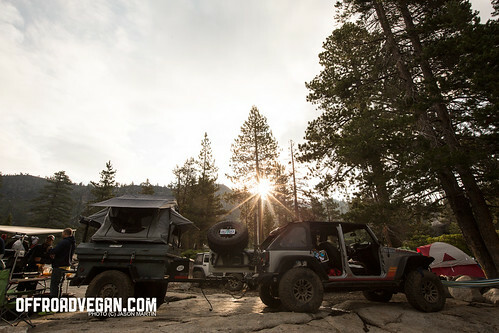 When jeeping for a long period of time, nothing is more important than a hearty breakfast. 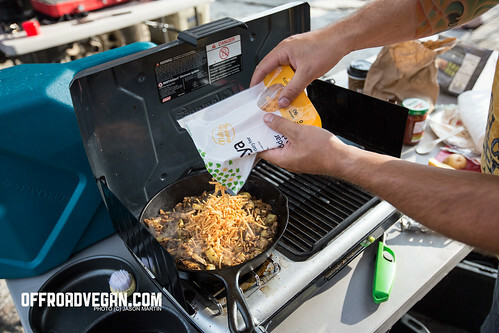 On our recent trip along the Rubicon Trail, we woke to a chilly Sierra morning and I decided to warm up with some breakfast burritos. Said chilly morning at Rubicon Springs. 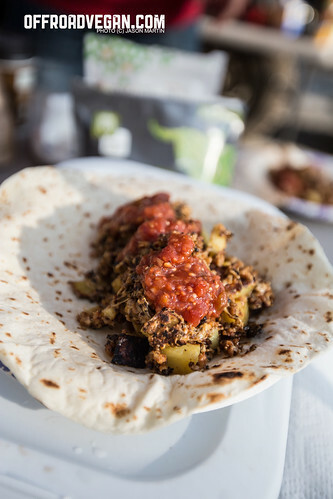 These are a twist of my friend Andy’s amazing breakfast burritos from Moab. Start by dicing the potatoes. Once diced, place into an oiled frying pan. I love my Lodge cast iron pan for these. Pan fry until they need about 4 minutes of cook time (barely crunchy). 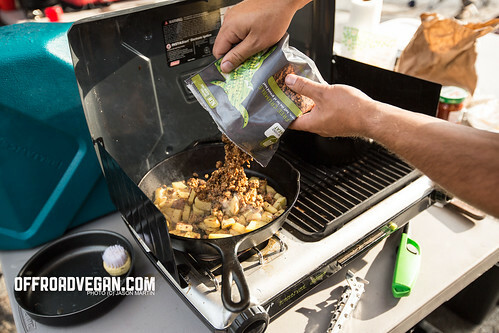 Add the entire bag of Beyond Meat crumbles, stir well. Allow to cook. Sprinkle garlic salt/spices to taste. Keep stirring. At this stage, we added the Daiya. This really pulled everything together which worked well. But, I would have probably preferred to add the Daiya later in the wrap. 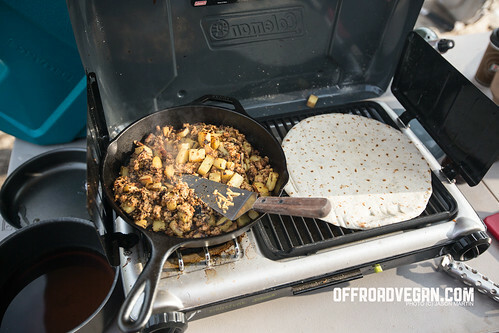 Warm the tortillas on the grill or near the campfire. Add the potato/Beyond Meat/Daiya mixture into the warm tortillas. Add Salsa and sour cream. Wrap them up and enjoy!